order to exchange different type of information through TCP Communication. For the purpose of communicating data with a PC, a data_server has been created in the NUERA project template. 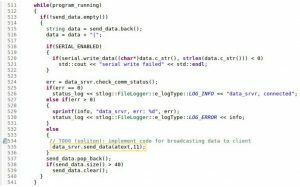 As shown in the following steps, by simply enabling the data server and calling the send_data(), you can program NUERA to send data to PC. The data server can be enabled or disabled by defining DATA_SERVER_ENABLED as true or false respectively in sys_constants.hpp. will use this port number as the TCP client end to connect to this data server. The Buffer Size and Data Timeout of the data server can also be changed in this file.